This morning, as you look at the shoe boxes collected right now, how many lives do you see changed? If I told you there were 257 boxes here right now, how many lives do you see changed? If you said 257, you still haven’t grasped this idea of living exponentially. When we live exponentially, we see God taking our lives, our opportunities, and yes our gifts, and multiplying them for his purpose, and power, and kingdom. We usually think too small. While we think addition, God thinks multiplication. So these 257 boxes won’t just touch the lives of 257 children, but 257 families, which might have 3 people per family, which would be 771 people, who will share their story of God’s love with 10 people, that’s 7,710, who then share the story of God’s love with 10 people, now we are at 77,100 people. But even that might be thinking too small because each box might change 1 child in a village of 100 people, so now 25,700 people are touched by God’s love and they each travel to a village of 100 so now 2, 570,000 people’s lives have been touched by the love of God. But, what if, just one child was to become an evangelist like Billy Graham, and another a nun like mother Theresa, and a third one becomes a crusader like Nelson Mandela? The number of people whose lives might be changed by just these 3 children would be in the 100’s of millions and then that number would grow exponentially as people are inspired and changed by their example. We think addition, God thinks multiplication. 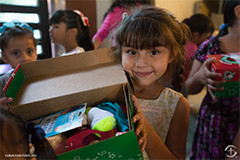 In these boxes we see one child changed, but God sees the world-changing power of giving. If you want to put together a shoe-box, you can do it online here. Exponential living begins when we start to see what is possible if we will live sold-out lives for God, and when we make the most of every opportunity we are given. Today, I want us to focus on the exponential power we can see in our own lives, and in our world, when we start to give the way God calls us to give. When we give, God doesn’t add our gifts together, God multiplies them so even more is available for God’s work. To learn why and how to give, we are going to look at a parable of Jesus found in Matthew 25. This is a long story, and I encourage you take time to read it, but let me just tell you what it says. A rich man was going away on a journey, but before he left he entrusted all he had to his servants. To one he gave 5 talents, to one he gave 2 talents, and to one he gave 1 talent. Now the word talent is the same word we might use to talk about our gifts, skills, and ability, but it was also a unit of measure that was often connected to gold and silver, so a talent was also seen as a type of currency. So a talent here is the combination of one’s gifts, skills, and abilities, as well as financial resources. Once the man gave away all he had to his servants, he left, but when he returned, each servant had to give an account of what they did with the talents they were given. The one who got 5 talents doubled that amount and made 5 more. The one who got 2 talents also doubled it and made 2 more, but it says that the one who received the one talent was afraid, so he buried what he had in order to give it back in full. And this is what the rich man said to that servant, you wicked and lazy servant. These are harsh words, but they show us just how seriously Jesus takes the issue of stewardship, because that is what this parable is about. It is about stewardship, our stewardship of God’s resources. #1. God Owns Everything. In this story, it is the rich man who gives his property to the servants. Matthew 25:14. The wealth belongs to the man, not the servants. It all belongs to the rich man. If we are going to learn how to live, and give, the way God wants us to, then we need to get this idea firmly in our hearts and minds. What we have does not belong to us – it belongs to God. Our homes, our cars, our clothes, our TV’s, our investments, and bank accounts don’t belong to us, it all belongs to God, and as God’s children, we are called to use these resources the way God uses His resources. So what does God do with all his stuff? He gives it away, he shares it with us. So the first thing we need to do is make sure that giving is part of our lives. The reason we give to God is because that reflects what God does with all the wealth of this world. God gives away all he has, so we need to learn to give. When we talk about giving a tithe, which means a tenth, or 10%, we are NOT talking about a law to follow in fear of being punished, we are talking about an act that helps us see that everything we have has come from God. We need to think of our gifts, and tithes, and offerings as a declaration of God’s ownership of all things. So a question to wrestle with this week is this, what would be different in our lives, and in our giving, if we really believed that God owns everything? How would this big idea change how we live, what we give, and what we keep for ourselves? Would we start to give because we realize that it is not ours in the first place? Would we give more because we want to be more like the God who gives? Would we give more because we know that this is the kind of life God wants for us, and therefore, the kind of life God will bless? What would be different in our living, and giving, if we believed that God owns everything? #2. We will all give an account of what we did with God’s resources. Matthew 25:19. Now let’s be clear, the account we will give will not be to the church, or to any person (except maybe your spouse), and it will not even be to the IRS, although they do ask for a lot of information, the account we will give, will be to God, because it all belongs to God. But we need to understand that we don’t give an account so that God can judge us and punish us, we give an account so God can encourage us and cheer us on. 2 of the 3 servants gave an account of their stewardship, and the rich man cheered them on. He encouraged them, and honored them. If we knew God would cheer us on in our giving, would we give more faithfully and joyfully? Here is the question we need to ask ourselves, How would we live differently, if we knew that we had to give an account, but it wasn’t to an angry judge, but a loving God? #3. When we give faithfully to God, God multiplies our giving. When the servant with 5 talents used those for the rich man, he doubled what he had. When the servant with 2 talents used those for the rich man, he doubled what he had. When we think addition, God thinks multiplication. When we take what we have, and give it to God, and use if for God’s kingdom, and God’s work, God doesn’t add to it, God multiplies it. During the time of Elijah the prophet, there was an extreme drought that left many people in need. God sent Elijah to a small town and told him that a woman there would feed him until the drought was over. Elijah went and found the woman who was in the process of taking the very last of her flour and oil and making a final meal for herself and her son. Elijah told her to first make him a small cake, and then to do what she had planned to do. So the woman took a small amount, from the small amount that she had, and basically gave it away. She made Elijah a small cake, and then God multiplied it, because she had enough for the next day, and the next, and the next. It says that she not only fed Elijah, but herself and her family for years. When we are willing to give to God what belongs to God, God multiplies what we have. This kind of giving not only blesses us, but others as well, because it multiplies what is available for the work of God in the world. Now please hear this, giving to God doesn’t mean God will multiply what we have to spend on ourselves, so that we can live extravagantly. God multiplies what we give, and makes sure we have what we need, and then multiplies the resources available for the work of God in the world. In other words, our simple gifts to God are blessed, and multiplied. In time, we find that we have all we need, and God is able to do more and more in this world. This is our story. And all of this is outside of what we budgeted each year on building improvements. So, in 10 years, our giving to God has been multiplied. We paid off a mortgage of $700,000 and God more than doubled that as we invested in ministry here and supported missions around the world, all outside of our yearly budgets. I’ll be honest, I can’t explain this, other than God has taken what we have given and multiplied it, and this is what exponential giving looks like. When we are faithful stewards of what God gives us, and when we give back to God a portion of what God gives to us, God multiplies it, and God makes more and more available for the work of the church in the community and world. While we are now living debt free, that doesn’t mean our giving comes to an end, because nothing has changed. It all still belongs to God, and we will still give an account of how we used God’s resources, and if we will continue to give to God, God will multiply our giving and bless our own lives, as well as our church, and the work we are able to do in our community and world. So we need to keep giving to God. And if you are already giving, I want to challenge you to think about giving back to God just a little bit more. If you give a percentage, like a tithe, remember that 10% was not the maximum, but the minimum, God called for. Can you give more? One dollar more per week becomes at least $23,000 over the course of a year. $100 more per year becomes $44,000, and when that is given to God, it accomplishes more than we ever thought or imagined. To become this kind of exponential givers, we have to see ourselves as Kingdom Investors, not Earthly Spenders. We can spend money on a new TV, the latest iphone, or another kitchen appliance or household gadget, or we can invest that money in the work of God’s kingdom. That money can add a little bit of pleasure to our lives. or it could be used to reach dozens of people in our community for Jesus Christ, and be multiplied by God to bring help, hope, and life to thousands around the world. We could spend $2 a day to buy a cup of coffee, or we could invest that $2 in the kingdom of God, and have over $45,000 to give to our work in Sierra Leone, or Belize. While all our giving may seem small, there is no small gift when we give in faith to God. When we give as God calls us to give, God blesses us exponentially, and God multiplies what we give to bless the world. Let me leave you with this final thought. Imagine what Faith Church might look like a year from now, imagine what our community might look like a year from now, and imagine what kind of an impact we could make in the world during the next year if each one of us moved from being an earthly spender, to a kingdom investor. Think of the amazing, God given, life changing opportunities that would open up before us if we would all step up our giving, because when we give, God takes our gifts and multiplies them, exponentially, so that together we can be blessed and in turn be a blessing. 1. Read the parable of the talents – Matthew 25:14-30. What does this parable tell us about God? About ourselves? About what we own? About the stewardship of our finances, time, and talents? What would be different in your life, and in your giving, if you believed that God really did own everything? Would you spend less on yourself? Would you start giving, or give more, to God? Would you be more generous? 3. We will give an account of what we did with God’s resources (our finances, time, and talents). What would be different in your life, and in your giving, if you believed that you would have to give an account? How can knowing God is there to cheer you on help your giving? 4. When we give faithfully to God, God multiplies our giving. When has God blessed you because of your giving? How did these blessings help you bless others? When have you seen God multiply your giving? How can these stories encourage you to give more faithfully and generously? 5. Commit to stepping up your giving to God and the church. Start giving faithfully to God’s work at Faith Church? Increase your giving to Faith Church by 1%.